This outfit is perfect for my fallish mood right now. All I want to do is carve pumpkins and drink hot cider. I loved the reincarnation of the plaid shirt last year (or maybe two years ago) because of all of the updated styles that came out including ruffles and longer styles. I love pairing a more “rugged” shirt with a skirt. I like the contrast, but it probably has more to do with my constant need to dress up. I would wear tights and skirts every day if most of the skirts at Forever 21 were not mini skirts. 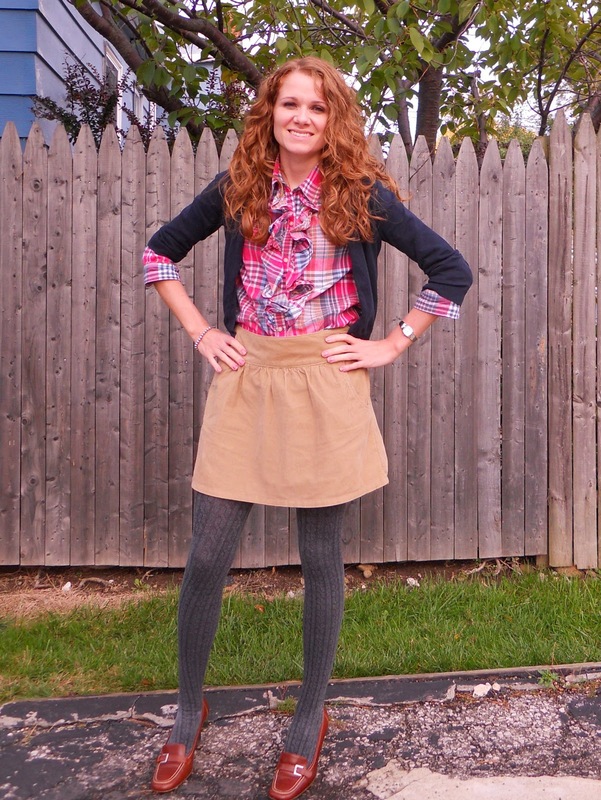 This skirt was one of my purchases during Old Navy’s Sweet 16 Anniversary sale. It was marked down from $24.50 to $16. I love this outfit! Great plaid! Very J Crew and Alexa Chung! I love this outfit! The colour of your shirt is just so lovely!